So the other day… alright let’s be honest, by the other day I mean about two weeks ago. Sorry, I’ve been super busy and haven’t had time to finally put this recipe up! Ok, back to the story. So the other day I was having a craving for chicken pot pie, but wanted to do something different. A lot of ideas floated through my head, For some reason one thing that I kept thinking about was cornbread. I don’t know, maybe because back in the day I used to order chicken pot pie with a side of cornbread from Boston Market, who knows. Anyway, the thought stuck and finally it dawned on me to do a play on pot pie but topped with cornbread! To take it one step further, I had some bacon in the fridge, so why not!? So here you have my Chicken, Bacon & Corn Casserole… Enjoy! In a large saute pan cook off your diced bacon in batches (if you do all at once you’ll end up with some crispy and some not-so-much, and a lot will stick together) at medium-high heat. Use a slotted spoon to remove from the rendered fat and place in a large bowl. Keep the rendered fat in the saute pan. Put the flour in a medium bowl and add your cubed chicken and thoroughly coat. Heat the saute pan with the bacon fat at medium-high and add the floured chicken. Cook until lightly browned, flip and repeat. Once lightly browned on all sides remove the from the saute pan using a slotted spoon and place in the bowl with the crispy bacon. Once again, retain the rendered bacon fat, which will now be slightly thickened from the flour, and keep on medium-high heat. Add the diced potatoes and cook until lightly browned on all sides. Remove from the pan using a slotted spoon and place in the large bowl with the bacon and chicken. Add the corn kernels, cream of chicken and cream of celery soups as well as the salt, pepper, garlic powder and paprika to the bowl and stir until well mixed. Place the mixture in a 9″x13″ baking dish. Now let’s make the cornbread topping… Combine the dry ingredients in a medium bowl then add the milk, melted butter and eggs. Using a whisk or hand mixer stir until a batter is formed. Spread the batter evenly over the filling in the baking dish. Place in the oven and bake for 45-55 minutes, until the top is a light golden brown. Allow to rest for 15 minutes before cutting and serving. 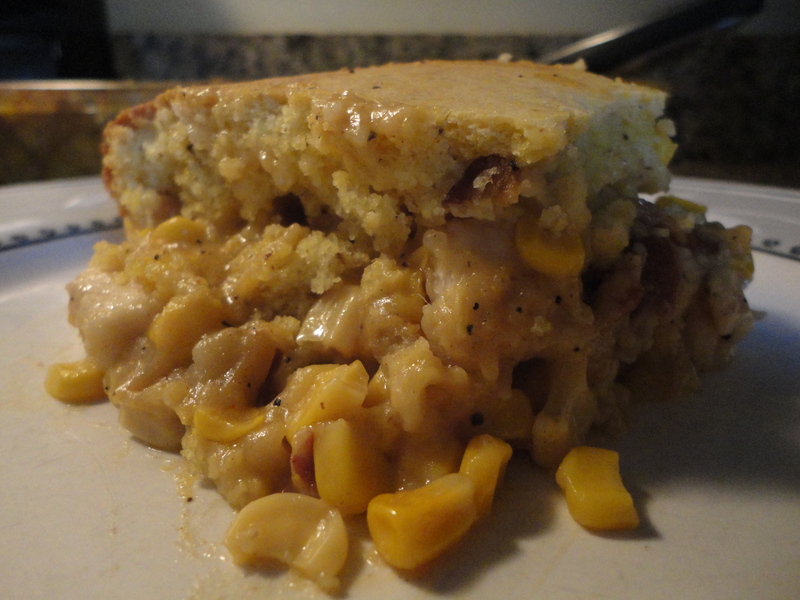 So that’s it… my morph between chicken pot pie and a side of cornbread, with some bacon thrown in for good measure! I hope you’ve enjoyed the read and will try the recipe. Trust me when I say it’s absolutely delicious, and great for the entire family. My kids went NUTS over it! Tags: bacon, baking, casserole, casseroles, chicken, comfort food, cooking, corn, cornbread, dinner, easy recipes, food. Bookmark the permalink.